You wake up to the 5.30am alarm feeling exhausted. Your first thoughts are ‘here we go again’. You didn’t sleep well as your head kept going over and over all the things you need to do and feeling anxious about getting it all done in time. Time for a quick shower then head to the kitchen to make a much-needed coffee to wake you up before starting the same morning routine. Kids up, lunches made, uniforms ironed, make breakfast and then hassle the kids to eat it. Then you just make it into the car to leave on time to do the mad kid drop off before rushing to work, knowing you will have to do it all in reverse in a few hours. 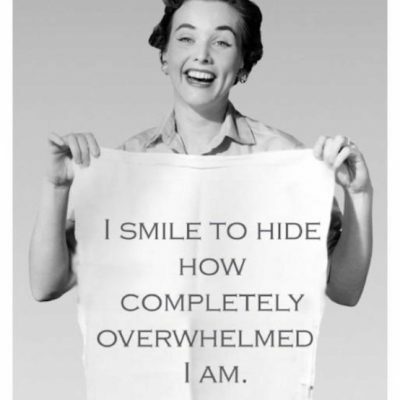 You feel like you are on a never-ending treadmill of stress, anxiety and overwhelm. When you finally fall into bed at night you are exhausted, frustrated and maybe even a bit teary and you think to yourself, ‘this is all getting to be too much’. You feel overwhelmed, stressed out and anxious about so much going on in your life and maybe the lives of others whom you care about. So, what’s really going on in your mind and what can you do about it? Think of your brain as having two major parts. You have a feeling brain and a thinking brain. Your feeling brain is your limbic system or sometimes referred to as your reptile brain. This area of your brain is responsible for making you feel certain emotions such as stress, anxiety and fear. Then you have ‘thinking’ part of your brain, which is called the prefrontal cortex. This part of your brain is located behind your forehead and it plays a key role in determining intelligence and regulating the limbic system. Think of your prefrontal cortex as the logical part of your brain that can dissociate from negative emotions such as fear, sadness, anger, hurt and guilt so we can process them. The key is for your brain to work in balance but what happens when there is no balance? When your emotions start to spiral out of control, your limbic system (feeling brain) takes control and your prefrontal cortex cannot do its job properly. This can trigger feelings of stress, anxiety and fear. A good example of this is when you are having an argument with someone and your emotions start to heighten and you no longer seem able to offer logical points of view. Later once you have calmed down and your emotions have reduced you are able to logically think about the discussion and all the things that you could have said but didn’t. The same imbalance occurs when you feel anxious. When you are lying in bed at night after tossing and turning for what seems like hours, you find yourself worrying about anything and everything. This creates feelings of anxiety. Consider anxiety as a fear of the future. The answer of course is: “No”. When we worry about things we fear in the future we get a bad feeling, often around the stomach or chest. Because our unconscious mind moves away from pain, it often prevents us from doing the thing we feel anxious about. For example, if you feel anxious about speaking in public, your unconscious mind will do anything to avoid having to do it. People feel anxious about what may happen tomorrow. It has not happened yet. So, you are worried about something that doesn’t yet exist. In other words, fear of the future is made up, but your unconscious mind doesn’t know that. It believes it is happening right now and so starts the chemical chain reaction in your body. Have you ever watched a scary movie? Logically you know it isn’t real and you know that there are actors, people on the set everywhere and they would have run each scene several times to get it right. You know all that consciously but when the scary suspenseful music comes on, the hairs on the back of your neck start to prickle, your heart rate increases, you start to sweat and you scream in fright. This is your body’s physical response to the stressful stimuli. So why do you produce a chemical reaction in your body to something like a movie that isn’t real? That’s because your unconscious mind doesn’t know the difference between real and not real. It watches the movie, sees the stressful stimuli on screen and then starts the chain reaction of ‘fear’ in the body. The good news is that we can use this to our advantage. If your unconscious mind doesn’t know the difference between real and not real, then it stands to reason that if you imagine the most positive outcome then you will spark a different chain reaction in your body producing an entirely different physical reaction and behaviour. When we feel anxious about something we are imagining it turning out bad i.e. the plane crashing, not getting to work on time or something happening to our kids. How often does that actually happen? 1% of the time? 2% of the time? Let’s say 2% of the time it turns out as bad as we had imagined. So, that means we are wrong 98% of the time. That’s not reality, it’s fiction. What to do when you are feeling down, anxious or overwhelmed? Even small amounts of exercise will help clear your mind and make you feel like you are back in control again. Exercise also helps you to sleep better which is vitally important to managing stress levels. When you feel overwhelm your brain is becoming overloaded with information, tasks and to-do lists. Consciously you can only process so much information at a time. Most people can only hold approximately 7 ‘chunks’ of information (plus or minus 2) in their conscious mind. When you are trying to do too much or process too much information, your prefrontal cortex is struggling to logically process all this information. You start to worry, panic and feel stressed and so your limbic (feeling) brain takes over. The key is to chunk the information in your head down into manageable tasks. Get it out of your head and onto paper so you can resume looking at it logically, using your prefrontal cortex and create a plan of action to tackle each task. Rather than juggling multiple tasks and find yourself getting nowhere, focus on each task and give it the attention it needs. By focusing on all the things in your life you are grateful for, your brain changes focus from negative thoughts to positive thoughts. The result is you begin to create positive emotions which in turn lifts your mood and you can create healthy ‘feel good’ chemicals such as dopamine and oxytocin. Keep a gratitude journal and each morning write down 3 things you are grateful for and spend time thinking about each of them. Pay attention to the feelings you begin to create inside your body. Taking time out for yourself helps to bring your brain back into balance again. Especially if you are a consummate worrier and prone to focus on the worst possible outcome. If you consider all the above information, it is vitally important for you to focus on the best possible outcome for everything you do. I would like to invite you to register for your free Overcome Anxiety Introduction to Hypnosis video and Overcome Anxiety self-hypnosis audio track. Take time every day to listen, relax and start overcoming those feelings of anxiety and worry.